Ever watch those IRC Samurai re-runs at 3am? well I have, and almost every single movie has a scene in which they run up to each other, screaming, the hit is so sudden and quick that the viewer isn't given any indication as to who won. Until the rediculous amount of blod begins to spray out of one's body, in a way only Japanese film makers and Quintin tarantino can produce. The scene in this wall, is a cliche one, but it is very dramatic. one look at the character's face and you feel all kinds of painful emotions running through your body. It doesn't matter if he is good or bad, you can't help but pity his pathetic look. Of course, for those who've read Dogs, you'd know what the deal with the scene is, and for those who've read it AND know what the title means, well you can understand how well it fits. "Vicarious Atonement" is a wonderful song from the upcoming Mars Volta album, which you should all go buy! Why only three colors? These three colors provide the greatest contrast that can be made. Such a strong contrast not only fits the mood of the piece but it also strengthens it, it helps send that tingling feeling of surprise down the hairs on your back. Yet, there will be those of you who prefer color. In my opinion, if I were to add any sort of background, it would be too distracting and would oly disrupt the breath taking scene. If you notice, most of these scenes, when done in movies, are almost always done in a field, or a place where nothing can be seen behind the characters. Wow, thats really cool looking, I like the one you submitted here more than the colored version. 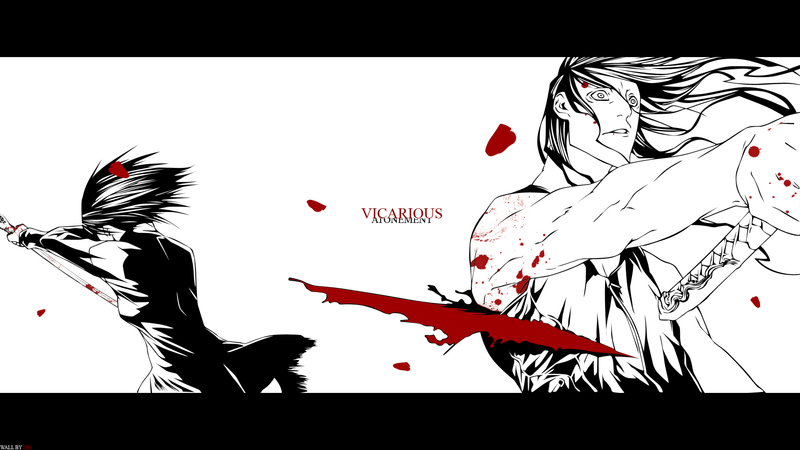 That black and white with blood reminds me a bit of Sin City, very cool! hmm... never seen this show, but I like freeze frames, this wall rocks, too bad my resolution doesn't fit, works well in my collection of fine walls. oh I love those scenes in samurai movies. They're great. And yes I think with just the three colors it portrays the moment better. Very cool. lol this wallpaper is kinda different from the other wallpapers that ive seen. Well, it seems that I'm becoming your fan. There are so few walles, almost in black and white (which I love), and with such ascetic yet powerful exprecion (most have colorful, textureful, etc. backgrounds). Soooooo... simply, one of the best wallpapers I've seen. Thank you very much for sharing! But still, really great wall. Wonderful fight between Naoto and Magato. *sigh* love the manga. No idea if there's an anime on this already. Thanks for sharing. Prefer this version with only three colors 2 neutrals and 1 primary. beautiful^^ Thanks for the upload! AWESOME, great job and thank you for sharing.